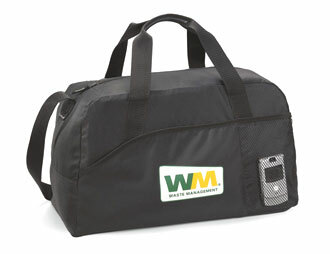 Help the planet get healthy while you're at the gym with this attractive duffel Front pocket with Velcro closure Front pocket for water bottle (water bottle not included) or other small accessories Adjustable shoulder strap and top carry handles This product is made from 51% recycled fabric. (1) Front pocket center between handle 4.5" dia. (2) Back panel center 5.5" dia.